Looking for a New Volkswagen Beetle in your area? 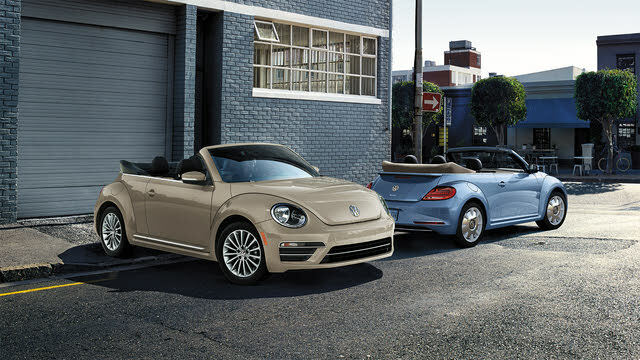 CarGurus has 671 nationwide Volkswagen Beetle dealers with 14,575 new car listings. The distinctive Beetle came to represent Volkswagen as soon as it debuted several decades ago, and then returned with renewed vigor when a modern version was introduced in 1998. Unfortunately, the market for a two-door, retro-inspired compact car is limited, so Volkswagen has announced that the 2019 model year will be the current Beetle’s last, with no plans for a replacement. To that end, the Beetle will go out in style with two Final Edition trims. For 2019, both Coupe and Convertible body styles return, with a couple of feature colors. Safari Uni harkens to the Harvest Moon Beige color from a decade ago, while Stonewashed Blue reaches further back to pay tribute to the 1970 Jeans Bug, as well as the recent 2016 Beetle Denim. You can also select from Pure White, Deep Black Pearl, and Platinum Grey. There are also new wheel choices. The standard 17-inch wheels are a 15-spoke design, while the 18-inch wheels consists of discs meant to evoke the chrome hubcaps fitted to the Mexican-market 2003 Última Edición Beetle. Finally, all trims feature a “Beetle” rear badge in place of the “Turbo” badge on some earlier versions. On the other hand, there’s no extra ceremony regarding the Beetle’s sole engine choice for 2019, a return of last year’s 2.0-liter inline 4-cylinder engine. Still, it’s a potent unit, making 174 horsepower and 184 pound-feet of torque. All trims come with a 6-speed automatic transmission and front-wheel drive (FWD). Fuel economy sits as high as 26 mpg city, 33 highway, and 29 combined. The trims are split into Final Edition SE and Final Edition SEL designations. 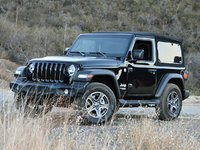 The former comes standard with body-color side mirrors and door handles, 17-inch wheels, heated wiper nozzles, keyless access and start, a leather-wrapped steering wheel, automatic climate control, a 6.3-inch touchscreen infotainment system, cloth-and-leatherette upholstery with a special rhombus pattern, tri-color ambient lighting, and (for coupe models) a power sunroof. Meanwhile, the Final Edition SEL gets 18-inch wheels, diamond-stitched leather seating, HID headlights, LED daytime-running lights, LED taillights and fog lights, navigation, and Fender Premium Audio. Safety equipment has always been light on the Beetle, but things are a bit better this year. In addition to the requisite airbags and reversing camera, the Final Edition SE trim benefits from standard blind-spot monitoring and rear cross-traffic alert. The Final Edition SEL trim tacks on rear parking sensors. The Insurance Institute for Highway Safety (IIHS) gave the Beetle a marginal driver-side small overlap crash score, but perfect marks everywhere else. Volkswagen had plenty of inspiration for the Beetle’s swan song year, and so the 2019 models are uniquely identifiable for their tributes to the model’s vast heritage. And although Volkswagen has not announced a replacement model, we can’t help but hope that the brand’s upcoming battery-electric platform might allow for a resurrected model someday, this time with the power going to the rear wheels, like the original. What's your take on the 2019 Volkswagen Beetle? Enter your zip to see incentives for a new Beetle in your area. How Do You Open The Hatchback On A 2019 VW Beetle?